The Royal Society for the Protection of Birds (RSPB) says rare choughs nesting on the Lizard in Cornwall have hatched chicks for the third year running. The chicks have not yet been sighted, but there are signs they might soon be flying the nest. The RSPB says the female has been spotted with fragments of shell leaving the cave where she has been nesting. The same birds have successfully reared three or possibly four chicks during the past three years. The RSPB has now mounted a 24-hour guard on the eggs at Lizard Point close to where they have been hatching to protect them from damage. 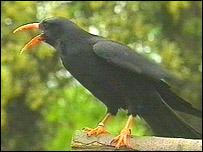 The choughs' rarity makes them a target for egg collectors. The black-plumed birds - with red legs and a curving red beak - are a symbol of Cornwall. In the 19th Century there were more than 100 pairs in the county. But the bird vanished after its food source dried up because of a decline in cliff top grazing and the use of pesticides.